Slovenian police used tear gas late on Friday to disperse a group of migrants on its border as the country’s government said it was considering opening safe corridors for refugees to pass through the tiny Alpine country. The incident happened at the Harmica border crossing as several hundred migrants demanded to be allowed to enter Slovenia. After over an hour of tension, riot police used tear gas to stop migrants, some with children, that were pushing against a police cordon at a bridge on the border. 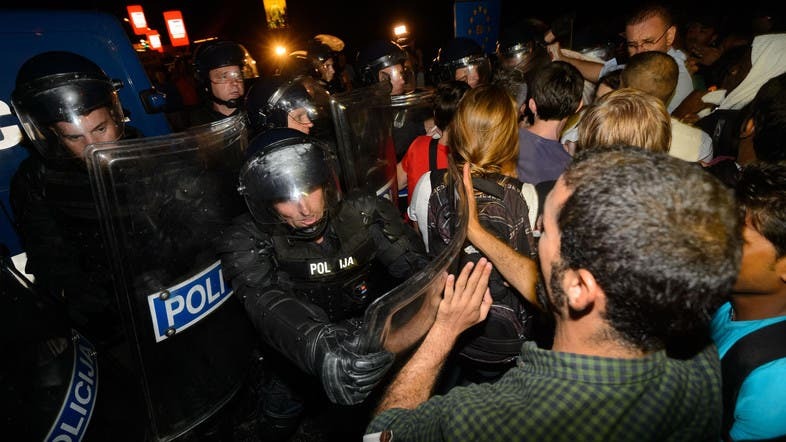 The clash happened just hours after Prime Minister Miro Cerar announced Slovenia might consider the creation of safe corridors for refugees wanting to reach northern Europe if they continue arriving in large numbers. “If the pressure of refugees (on the borders) becomes too strong, Slovenia will certainly discuss... possible so-called corridors with all the countries that might be concerned,” Cerar said in a statement after a meeting of the country’s National Security Council. The Slovenian authorities on Friday registered over 1,000 refugees that had entered the country while more than 700 were still at the Obrezje border crossing, 20 kilometres (13 miles) east of Croatian capital Zagreb, waiting to be allowed in. “New refugees continuously arrive so it is very hard to have exact figures,” Slovenian police spokeswoman Alenka Drenek told AFP. On Thursday Slovenia suspended all railway traffic with Croatia after a group of some 150 migrants tried to enter the country on a train bound for Zurich in Switzerland. "We refer to media reports concerning the use of pepper spray at the Rigonce border crossing, which contained misleading allegations. Our inquiries confirm that the spray was used by a police officer against a single protester, who was part of a larger group of protesters trying to break through a police cordon. The group had become increasingly violent and had resorted to throwing sticks and plastic bottles at the police. Individual protesters aggressively pushed officers and rounded upon one police officer, who then used pepper spray against a violent protester. The use of means of coercion is defined in a regulation, which specifies when a police officer is allowed to use a particular means of coercion. Pepper spray is one of the milder means of coercion that police may use to maintain public order and ensure people’s safety. According to police officers, no one was injured as a result of its use. Pepper spray was not used against the group of protesters but against an individual who breached public order."